It's Simple - Our wizard make sending your voice or text message a cinch! 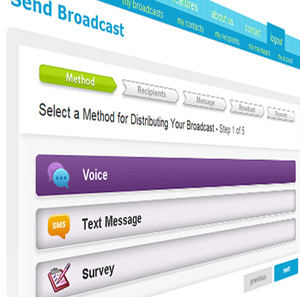 It guides you through a few simple steps to reach your recipients within minutes! Wanna see how simple it is? It's Flexible - Whether you have a professionally recorded .wav file, want to record your message over the phone in your own voice, or even type in your message, you've got tons of ways to record your message and create your recipient lists! We're Good Citizens - We look out for Mother Earth by helping you reduce paper use, and we look out for our fellow man by reducing spam. It's as irritating to us as the next guy. We try to prevent illegal and inappropriate use by having our system verify all caller-IDs for voice broadcasts, and we keep on the lookout for broadcasts which have inappropriate messages, inappropriate distribution lists, or violations of Do Not Call rules and regulations. Automatically Add Contacts - Why manually type in a list of clients when they can add themselves automatically when they join your website? Just have your customers or fans click on a link on your website, in your newsletter, your advertisement, on your Facebook page, in an email, or wherever you want. We'll provide your web guru with simple instructions on how to add clients to your Gigabark-based distribution list from a form on your web page. Our API Reference provides much more information on the things you can do automatically. Use your Caller-ID in Voice and Survey Broadcasts - The caller-ID of your broadcast can be your organization's telephone number, so your contacts will always know it's you. You can modify the Caller ID of your broadcasts to any telephone number you wish. Being the good citizen that we are, we try to prevent illegal and inappropriate use by having our system call that number and prompting the answerer to authorize this number. Collect Responses - Get RSVPs, feedback, or opinions from your recipients. Maybe you need to collect digit presses ('Press 1 to confirm your appointment') or voice responses ('After the beep, please provide comments or suggestions which may make your stay with us more enjoyable.')? Do you have complex decision trees? Use our survey tool to find out whatever you want to know. You can build a survey with our application that you send out or have them dial-in to take a survey. You can even leave a different message on a voicemail where you can ask them to dial-in to the survey. We can capture many different types of responses. Very Secure! - All data passed to and from Gigabark servers is encrypted with 256 bit SSL certificates. There is no need to worry about the privacy of your messages, call lists, payment, or other information. No Hardware or Software - The web interface is a perfect fit for organizations whose message volume doesn't justify large capital investments. There is no equipment to buy and nothing to download. Any organization with a simple internet connection can utilize Gigabark's services to make as many or as few messages as required. Simply login to your online account and start communicating with your contacts! No Waiting - Run your broadcasts without waiting, no matter how many other people are running broadcasts at the same time. Most organizations will find the broadcast speed of our systems more than satisfactory, but some may have special needs for the throughput of a broadcast, particularly with very large broadcasts. For these special cases, your Gigabark experience may benefit immensely by contacting sales at 1.888.833.4604. Around-the-clock Availability - You can send your broadcast at any time of day, whenever you want. Gigabark is available around-the-clock. Our servers are located in state-of-the-art Network Operation Centers with back up power generators to maintain high availability. Upload a file that you've created on your own PC or had professionally recorded. Record a message over the telephone. Our system will call you. Our wizard will prompt for your telephone number. You can also listen and re-record if you're not satisfied. Its just as easy as recording a voicemail! Call in to our system. Currently, we have to set this up for you, but soon we'll provide you a phone (and maybe a PIN) so you can do it yourself whenever you wish. Type a message and have our industry leading text-to-speech engine convert it to a synthesized voice message.